They were a voracious family – her seven children, husband and mother-in-law. By the time a meal was through, three different women would have taken turns at the chulhas: Imli, her mother-in-law and eldest daughter. The two earthen structures built side by side into the kitchen wall were at times insufficient when the entire family decided they were all hungry at the same time. Mother-in-law Sukhni generally milked the cows, warmed litres of milk and set the curds in the morning. Eldest daughter Maho made a pile of parathas for breakfast, served with rich creamy milk and omelettes that Imli would prepare in rapid succession on the other stove. On most days Imli’s husband headed for the fields with the young lads at his heels right after that to beat the heat. At harvest time, the entire family accompanied him. The two younger sons and youngest daughter went to the school nestling by their house. For lunch, Sukhni peeled and cut vegetables by the kilo. Some lentils, rice and rotis complemented the vegetable dish. Evening saw them essay a gravy preparation invariably accompanied by another pile of rotis or parathas. Imli’s cousin from England called them Indian breads. It was difficult to juggle dishes for so many mouths with diverse tastes. Apart from wheat and rice, on their land they grew mustard, pumpkin, cabbage, cauliflower and beans, but some of these were seasonal. To buy other vegetables from the market meant dipping into her husband’s meagre monthly pension. This they were saving for their daughters’ marriage. Better to cook lentils or pulses in thin, heavily peppered gruel. That way the kids ate less. Their staple diet included potato, available cheap and in abundance. Parathas stuffed with boiled and spiced potato made for a sumptuous breakfast, and kept their stomachs happily filled till lunch. Imli had mastered the trick of pairing potatoes with other vegetables. She was very good at making potato rolls, or she would add finely chopped boiled potato to the curds served with some dal and delectable green chutney. She had picked up tips from her aunt and mother-in-law, and was now teaching Maho. They breathed a sigh of relief when new vegetables started coming in. Still, these were too expensive and the family could not indulge itself much. One night, having served dinner to most of them, Imli discovered she was going to run out of dal. Sukhni suggested that she add a little water to raise the quantity and pass it on to the little boys, knowing they would not be able to make out the difference. Imli was busy rolling out rotis at a steady clip to keep everyone plied, while in one part of her mind she ran through the stock at home that she could use for her own dinner. It had been a tiring day, and she knew she needed to eat soon. But eat what? The last sack of potatoes lay nearby, almost empty. She overturned it to see if any potatoes remained. Five or six rolled out. By the time she was through with baking the rotis, there would be no time to cook these, she thought. 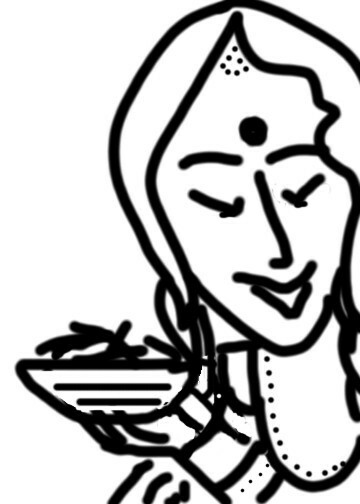 She recalled her mother talking about the pachaula … the bottom of the chulha where the ash and embers fell, to be cleaned out after the stove went cold. The fire was burning bright and the ash from the coal, wood and cowdung cakes was heaping up in the pachaula, too hot to touch. She chucked the potatoes in there, hoping they would roast in time. “Mother, there’s hardly any food left for you,” said Maho worriedly. She had come to finally fetch dinner for herself after running to deliver to everyone the piping hot rotis her mother had been making. “Don’t worry, child, I’ll manage,” Imli assured her daughter. “And then there is always the pachaula,” she remarked, half in jest. Unaware of her mother’s little secret, Maho sat down to eat with her brothers. As she made her way to the courtyard corner where used utensils were stacked, she saw Imli scraping the bottom of the stove. The moonlight was not bright enough for Imli to spot Maho in the shadows. Anyway she was too busy poking about in the ashes ahead of her private dinner. She drew out the roasted potatoes and nearly singed her fingers. When they were cool enough to handle, she peeled the potatoes, taking her time to slice them into lovely golden strips. She reached out for some lemon and salt. Very deliberately, she squeezed the sour juice drop by drop, sprinkling salt where the juice ran off the potato fingers. Maho tiptoed out and fetched her grandmother and father to share the spectacle of her mother enjoying the offerings of the pachaula. Nice comforting story. Sometimes you have to make do with scrapes in life, but they might just turn out to be equally gratifying. Thanks, Preeti. Indeed, it always works to look at the cup of life as at least half full.